In this Manhattan family home, the master bedroom is accented with purple in the bed and drapes. The custom-made bed is upholstered in a Rogers & Goffigon linen, and the bedding is by Casa del Bianco. The carpet is by Stark. The living room of this São Paulo house showcases tones of purple throughout. The built-in concrete banquette is fitted with velvet cushions and the rug is Chinese. Concrete tiles colored with iron oxide line the floor. In their Jaipur, India apartment, fashion designer Liza Bruce and her husband Nicholas Alvis Gega appointed a vibrant shade of purple to the veranda walls. The carved-wood table and bench blend with white-painted polyhedrons and mercury-glass balls. In this English manor house, the library sofas are by George Smith, and the armchairs, which are reproductions of Victorian originals from Somerleyton, are upholstered in fabric by Bernard Thorp; the mahogany Pembroke side table dates to 1790, the Axminster rug is a copy of a 17th-century design, the 1920s oak bookcases are by Wilcox of Warwick, and the walls are painted in Teal by Paint & Paper Library. 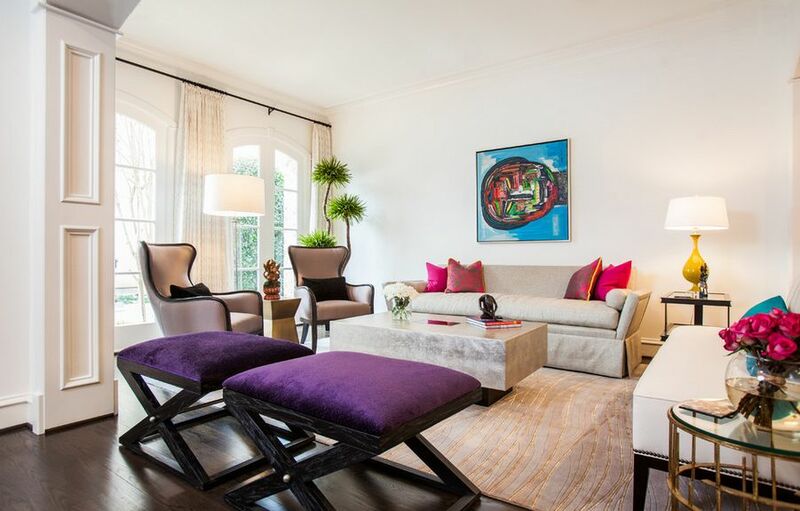 “The 7-year-old’s favorite color is purple, so we used it,” says Miles Redd of a family’s kid-friendly apartment. “We made a room she can grow into.” Antique pieces like the Chinese rug and Louis XV chauffeuse can withstand the test of time, while a lattice motif adds interest up top. Designer Charlotte Lucas likes to inject fun into her projects, and this client’s bedroom in Spartanburg, South Carolina, is no exception. An antique settee covered in a Brentano velvet adds a splash of color against wallpaper by Black Crow Studios. Although the custom rug in this girl’s bedroom sets the scene, Tableau wallpaper and Aga fabric by China Seas take the purple palette to the max. Designer Nicolette Horn finished off her daughter’s space by adding an owl pillow from John Robshaw. In model Jessica Stam’s New York apartment, the living room is characterized by purple walls, purple drapes and a purple custom-made rug by Stark. Armchairs upholstered in a Donghia cotton are circa the 1950s, as is the floor lamp, and the vintage sofa was found on eBay. In a Mexico City home that blends minimalism with folk art tradition, the living room purple chairs, cocktail table and purple sofa are all by Casamidy. The artwork over the sofa is a reproduction of a 1936 telegram from R. Buckminster Fuller to Isamu Noguchi explaining Einstein’s Theory of Special Relativity, and is by Jose Dávila. The 19th-century mirror is Mexican. Designer Robin Bell came up with the custom wall color and decorative Gothic trim herself for this Florida bedroom. Hinson’s Dottery Blue balances it all out, appearing on the club chair, ottoman and bedskirt. In the master bedroom of Vanity Fair style chronicler and social fixture Amy Fine Collins, the soft purple walls in the master bedroom serve as a sweet backdrop for drawings by Tony Viramontes. The circa-1915 bed is dressed in linens designed by Robert Hoven, who also created the wall treatment. The swing-arm lamps by Hinson sport custom-made shades. It wasn’t just an 80s trend. 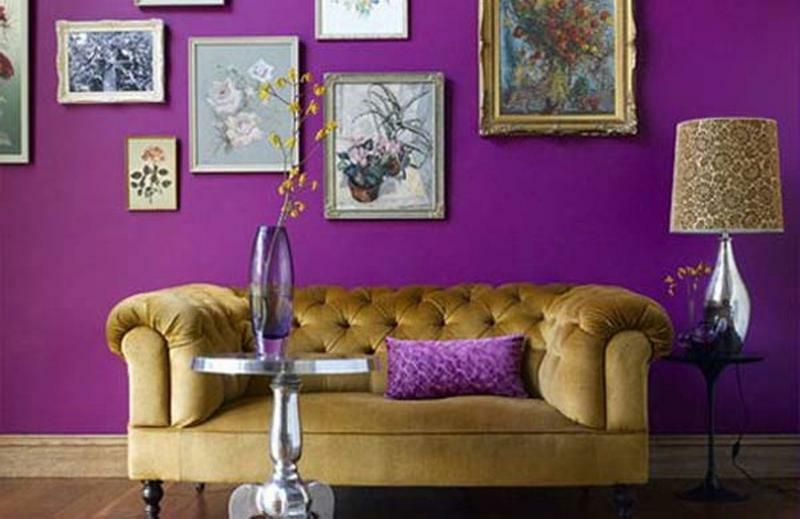 Done right, purple can be an distinguishing color in your home. Mark D. Sikes already used Benjamin Moore’s Misty Lilac in the living room of this Manhattan apartment, and the color doesn’t stop there. A similar hue appears in the guest bedroom on a custom headboard and pops out from the Cole & Son wallpaper pattern, Hummingbirds. Celerie Kemble and Lindsey Herod covered a Houston house’s guest bedroom with a shimmery wallpaper by Cole & Son. The circular window almost made one wall unusable, until the designers embraced the feature by building the purple headboard around it. Gray is known for its serene qualities, and there’s nothing more pristine than white, but don’t count out pansies and plums just yet. These soothing escapes that span the spectrum from mauve to indigo will prove to you the power of purple. In a Manhattan apartment decorated by Katie Ridder, purple Finnish wallpaper from the 1950s adorns the walls. A Waterworks sink is classic yet stylish, and is below a vintage mirror. In this Upper East Side apartment designed by Alex Papachristidis, the library is saturated in purple. The custom sofa is upholstered in a Manuel Canovas velvet and the cushions are in a Brunschwig & Fils cotton. The custom carpet is by Beauvais, the Louis XVI armchair is covered in a Braquenié fabric and the walls are heated in a Manuel Canovas lambswool. The print is by Andy Warhol. In this home designed by Lichten Craig, the soft-plum bathroom’s Venetian-plaster walls are by Orazio De Genarro Studio. 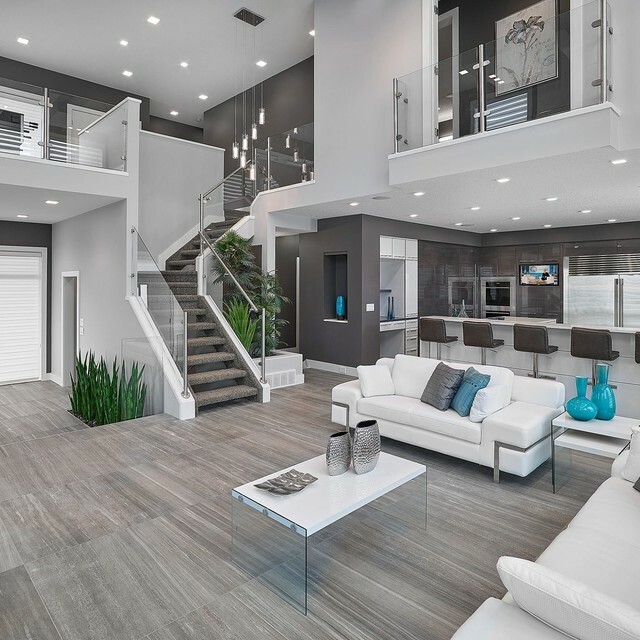 To optimize the natural light that floods the room, Craig added lightweight fabric curtains to the windows and installed a mirrored bath and cabinets. The purple tulips on this Harlequin wallpaper — Tulia — provides the palette for the rest of this Maryland bedroom. Green curtains from Lady Ann Fabrics feature a pink Samuel & Sons pom-pom fringe, while a regal canopy adds a fanciful touch. In Christina Juarez’s color-drenched apartment, the vintage Milo Baughman sofa is in a Cowtan & Tout velvet and a pair of 1970s chairs are in a Larsen velvet. The cocktail table and floor lamp are by West Elm, the side tables are by Donghia, and the pillows and rug are by Madeline Weinrib. The portraits are by Kimberly Brooks. “It’s hard to make twin beds exciting,” says Phoebe Howard. Her fix: Cover the high headboards on Hickory Chair’s Candler beds with an overscale print, Seville Medallion by Galbraith & Paul. In a traditional stone house in Bel Air, decorated by designer Kim Alexandriuk, a daughter’s room is modernized with a blue-purple ceiling, linen curtains by Christopher Farr and cream walls. Christian Astuguevieille designed the Afribaton chair, marble-topped table, hemp pedestal, Mira mirror, and sconce prototypes in the meeting room of his French duplex; the crystal chandelier is from the early 20th century, and three of his 1992 glass sculptures in ultramarine blue fabric and bulrushes sit atop the 19th-century marble fireplace. Visitors at this Southampton house stay in a sumptuous retreat designed by Ann Pyne. 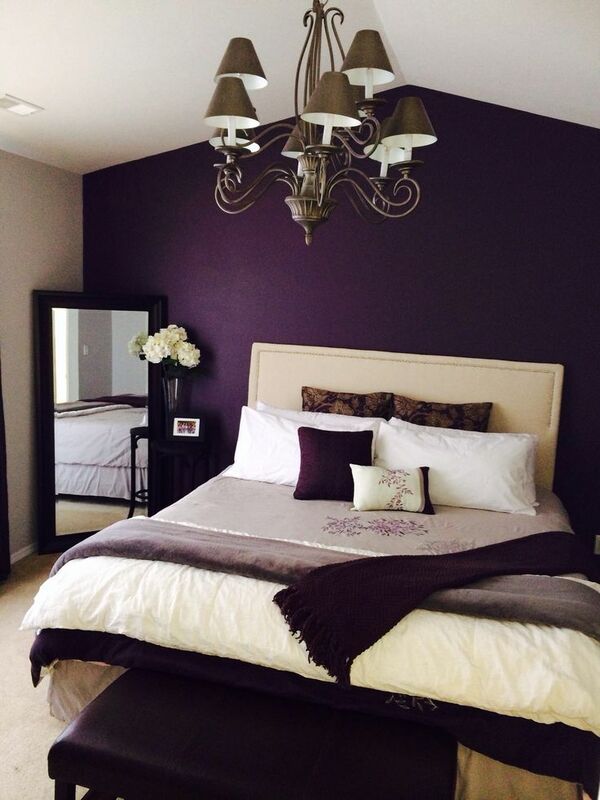 Twin beds provide twice much as purple, as well as extra space. “Friends like to put their clothes and things — or their pet — on one bed, and themselves on the other!” she says. Also in the home of Christina Juarez, the custom Avery Boardman chaise has a seat cushion in a Claremont fabric and a back bolster in a Quadrille fabric. The cocktail table is by Jonathan Adler, the dresser is by West Elm, and the vintage lamp from Dragonette Ltd. has a shade by Irving & Morrison. Artworks by (from left) Yee Wong, Wayne Pate, and Takashi Murakami hang on walls covered in a Kreme wallpaper from Studio Four NYC. In the same purple-filled apartment designed by Papachristidis, the custom bed is upholstered in a Brunschwig & Fils fabric and dressed in bedding by Leontine Linens. The light fixture was found at a Paris flea market, the lamps are by Christopher Spitzmiller with custom shades by Blanche P. Field and the rug is a custom design. The walls are sheathed in a linen by Manuel Canovas, and the curtains are of a silk by the same company, with Samuel & Sons trim. In the master bedroom of an Upper West Side apartment, a Hästens bed is dressed in linens by Sferra and Olatz, the circa-1970 side tables are by Milo Baughman, and the lamp is by Taylor; the walls are painted in Farrow & Ball’s Cinder Rose, and the photographs are by Marsha Lebedev Bernstein. In author Holly Peterson’s Hamptons home, decorated by Kimberly Hall, the master bedroom’s splashes of purple are complemented by a more neutral grass cloth wall covering by Phillip Jeffries. The custom rug is by Madeline Weinrib. 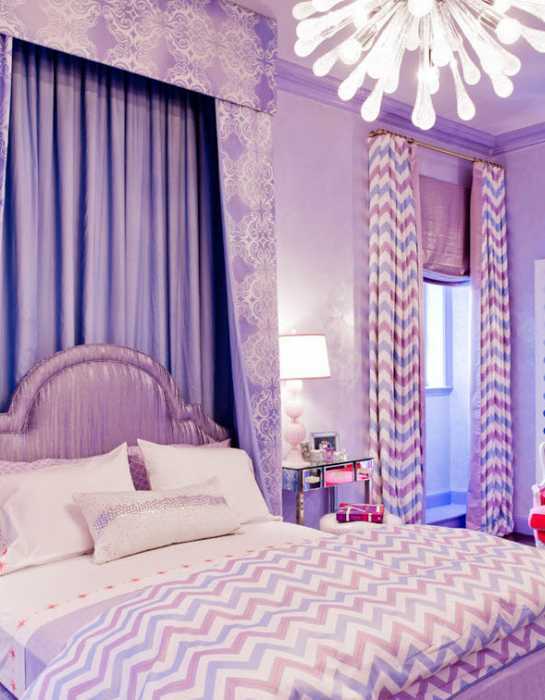 In fashion designer Reed Krakoff’s home, the daughter’s room is playfully splashed with purple, pink and orange. The suede-upholstered ottomans are by Coach. A Jean Royère sconce and Bill Blass sketches adorn the cream-colored walls. 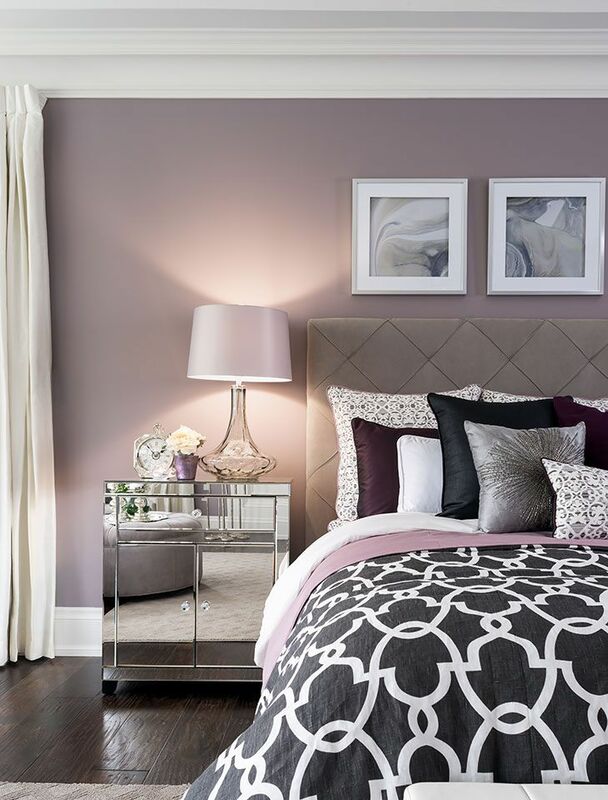 With Benjamin Moore’s Sea Foam on the walls, Krista Ewart warmed up a girl’s room with magenta-colored fabrics. Layers of natural linen and Raoul Textiles’ Coverlet cozy up the beds, and a Prestige Mills rug adds softness underfoot. In the living room of an 1870s carriage house in Bedford, New York, the purple dhurrie is 19th century. The custom sofa is covered in a Kravet cotton and the cocktail table is by Martin Szekely. The Egyptian light fixture is from Liza Sherman. In the master bedroom of this West Village apartment, the bed and side tables are custom designs, the walls are sheathed in a custom grass cloth by Work + Sea, and the sconces are by Jason Koharik. In a Manhattan townhouse, the master bedroom’s purple custom-color wallpaper is by Gracie. The cast-metal bed is also a custom design, the headboard and bed skirt are of a fabric by Lelievre and the canopy curtains are of a silk by Dedar that was embroidered by Penn & Fletcher and lined with a fabric by Stark.